EHS provides turnkey asbestos services. Building surveys, inspection, building material analysis, air samples, abatement and consultation are among the services provided. EHS personnel involved in providing services meet or exceed qualifications of comparable persons in the abatement industry. EHS conducts building surveys prior to renovation or demolition if asbestos containing building materials (ACBM) will be disturbed. Project specifics are necessary to make sure that all materials are tested prior to project initiation. Generally the project manager is responsible for scheduling surveys. Due to the amount of work on campus as much lead time as possible is necessary. Building surveys can take a great deal of time depending upon the scope of the project, age of the structure and other factors. Personnel involved in renovation or demolition projects may request EHS sample specific material encountered in the course of the project. 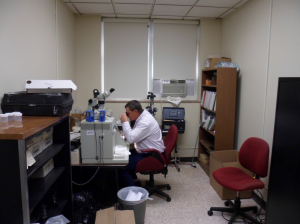 EHS has a modern laboratory with the equipment to perform asbestos identification of sampled building materials. Analysis is done by polarized light microscopy (PLM). Personnel are certified to perform analysis based upon successful completion of NIOSH course work. Analysis is done on materials sampled during building surveys or as requested. EHS has the capability to perform analysis of airborne asbestos samples. There samples are taken in support of the asbestos abatement program or to determine ambient levels. Samples are analyzed by light microscopy according to NIOSH protocols. Personnel are certified to perform analysis based upon successful completion of NIOSH course work. EHS maintains a database which is an overview of known locations of asbestos containing materials in University of Alabama buildings. The information contained in this database is intended to provide an overview of the KNOWN locations of asbestos-containing materials in University of Alabama buildings. Use of this information does not replace, supersede or nullify the requirement for an additional asbestos survey by EHS prior to any renovation, demolition or maintenance activity that disturbs building materials. Contact EHS if more specific information is needed. This Asbestos Survey Database will be updated whenever additional information becomes available. 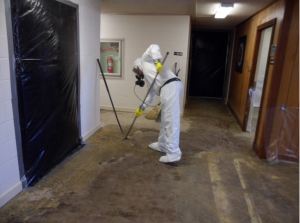 EHS has an asbestos abatement program that operates in conjunction with maintenance activities on campus as well as construction and demolition projects. EHS personnel certified workers and supervisors. EHS has 30 years of experience in managing on campus abatement projects. EHS is available to oversee, inspect and provide laboratory support to these projects as needed. EHS provides training to the campus community via the Skillport Academy Training Systems and classroom type sessions. EHS personnel also provide consultation services to the campus regarding asbestos related issues. EHS personnel involved in asbestos activities are highly trained and experienced. Training includes AHERA and NIOSH courses, worker and abatement supervisor courses, as well as Asbestos Awareness information specific to The University of Alabama.